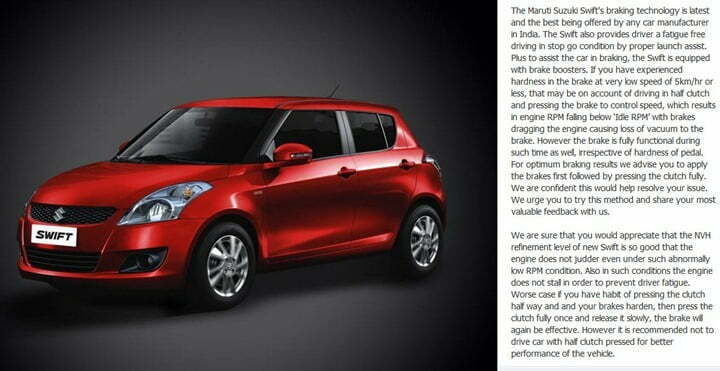 Why New Maruti Swift Brakes Stop Working At Low Engine Speeds? Maruti Suzuki India launched its one of the most popular cars Maruti Swift 2011 new model in India around mid of 2011 and since then it is selling like hot cakes. Its one of of the highest selling car from Maruti Suzuki’s stable specially the diesel engine models of Maruti Swift which are popular for their high mileage, sporty looks and sharp handling characteristics. But one of the problems which has been talked about by many customers of new Swift on various forums and websites it related to a serious issue with braking. The problem comes when the speed of the car is very slow and the clutch is half-pressed, which is very common in congested city traffic in bumper to bumper situation in many Indian cities. So far, hundreds of such incidents are reported by various owners across India (which is a small percentage considering the sales volumes of this car). Many of the customers also say that they have reported this problem many a timed to authorized service centers, customer care centers of Maruti etc. and the problem still remains. Some service centers did replace the booster and brake cylinders for some of these cars, but the problem is still there with these cars with problems. Since there is no governing body in India for safety control of the automobiles, SIAM has set up a Voluntary Recall Policy recently for Indian automobile makers, but Indian car makers don’t seem to be too willing to acknowledge the problems and call it a recall. We hope that Maruti Suzuki India will listen to the customers with such problems and will come out with a solution soon. We will keep you posted on the same, stay tuned to Car Blog India.